It's Eret here. I used Koi Pond Super Bundle Digital Stamp Set Digi918-929BC to make a shaped card. This bundle includes the Koi Pond Beauty Digital Stamp Set Digi918BC and Koi Pond Friends Digital Stamp Set Digi919BC. Those stamps are also available as rubber stamps. Beverly Cole drew them exclusively for Sparkle N Sprinkle. I love them! I used pre-colored flowers from the Koi Pond Super Bundle Digital Stamp Set. They are fussy cut with scissors and I added some sparkle with Sakura Glue Pen and Sunny Daze Glitter. The sentiment is included in the bundle, but if you fancy only the sentiment and not every Waterlillies used on the card, you'll want to get your hands on the Koi Pond Beauty Digital Stamp Set. The sentiment is printed out and I used Spellbinders die (Labels Twenty-Two) to cut it out. I drew a frame around it with Sakura Glue Pen and adhered Denim Microfine Glitter. Pink layer underneath the sentiment is cut with scissors out of Sticker Paper. I covered it with Ballerina Microfine Glitter and added some Ocean Breeze Microfine Glitter with Sakura Glue Pen to the edges. 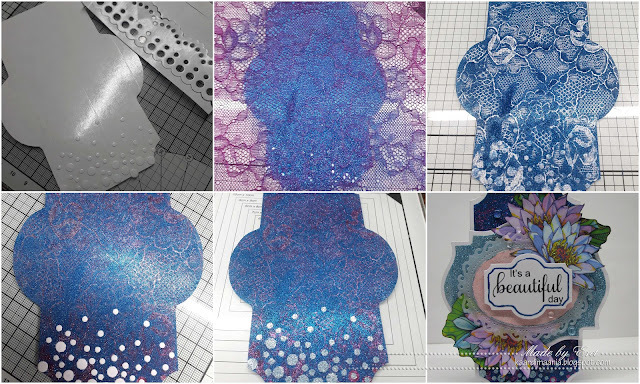 Vellum layer is die-cut with Spellbinders die (Lacy Ovals). On the following photo, you can see the process of making the background. 1. I started with die-cutting punch of tiny circles out of the protective sheet from Tear-ific Tape. I placed them to the label which was cut out of Sticker Paper. 2. I added lace on top and rubbed Denim Microfine Glitter all over it. 3. Then I brushed off all the loose glitter and removed the lace. 5. All that was left to do was to remove tiny circle masks and cover last bits of revealed tape with Ocean Breeze Microfine Glitter. Now, if you look closely, you can see some purple circles too. I accidentally peeled the circle masks off with the lace. Instead of placing them back, I added smaller circles on top. The card base is made with largest die from Spellbinders Labels Twenty-One set. Label underneath the Vellum layer is cut out of Sticker Paper which was covered with Ocean Breeze Microfine Glitter. As final embellishments, I added HAI Supply Mixed Clear Drops around the card.